The No. 17 Quinnipiac Bobcats returned to action this weekend defeating the Sun Devils of Arizona State University 5-2 on Friday night at High Point Solutions Arena. 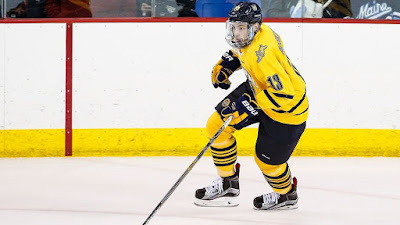 The second year Division I program made its second trip to Hamden in as many seasons but showed they still have a long way to go in order to become a top program. The men’s ice hockey team celebrated the arena’s ten-year anniversary with a ceremonial puck drop by Quinnipiac’s president John Lahey. The Bobcats got out to a quick start in the first period when senior captain Connor Clifton slipped past a defender on the blue line all the way to the net putting a wrist shot past Arizona State goaltender Robert Levin. Clifton's goal at 3:18 was unassisted. Quinnipiac continued to dominate throughout period pounding the Sun Devils with shot after shot but it wasn't until the latter stages of the period when the Bobcats got on the scoreboard again. After a Ryan Belonger boarding penalty put the Bobcats on the power play the Sun Devils failed to clear the puck in front of the net and Bo Pieper put it home a 2-0 Quinnipiac lead. K.J. Tiefenwerth and Thomas Aldworth picked up the assists on Piepers 9th goal of the season. Quinnipiac dominated the shot total in the first period 25-5 against the Sun Devils. Just 14 seconds into the second period Alex Whelan cleaned up a rebound with a backhand shot past Levin for his second goal of the season. Bo Pieper and Kārlis Čukste assisted on the Whelan goal who has been really solid for the Bobcats in the past few months. He has been one of the better players creating traffic in front of the net and his goal tonight showed what he can bring to the table. Quinnipiac out shot Arizona State 15-9 in the second frame and 40-14 through two period. Once again the Bobcats got on the board just 38 seconds into the third period when Chase Priskie ripped a shot past Levin from the bottom left circle for a power play goal to make it 4-0. Brogan Rafferty and Tim Clifton got assists on Priskie's goal. Four minutes later the Sun Devils got on the scoreboard when Wade Murphy ripped a shot from the top right circle past Andrew Shortridge for the goal. It was the 8th of the season for Murphy who transferred from North Dakota to the desert. The Bobcats closed out the scoring on their end with yet another power play goal from Chase Priskie his second of the game and fourth goal of the season when he ripped a one timer from the bottom left circle on a pass from Rafferty. Craig Martin also got an assist on the goal and this was Rafferty's 18th assist of the season as he leads the Bobcats in scoring as a freshman defenseman. The Sun Devils made it 5-2 on a goal by Jack Rowe at the 17:23 mark of the period. Quinnipiac out shot Arizona State 17-8 in the final frame and 57-22 for the game. The teams combined for 24 minor penalties and 48 penalty minutes. 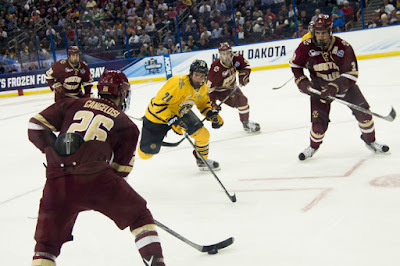 Quinnipiac went 3 for 10 on the power play and dominated the Sun Devils on face offs 46-23. Freshman Andrew Shortridge made 20 saves in the win to pick up his 5th win of the season and third in the last four games. Quinnipiac and Arizona State return to action Saturday night at 7pm for the Bobcats last non conference game of the year.